With warmer weather fast approaching I’ve found myself more focused on skincare than ever. 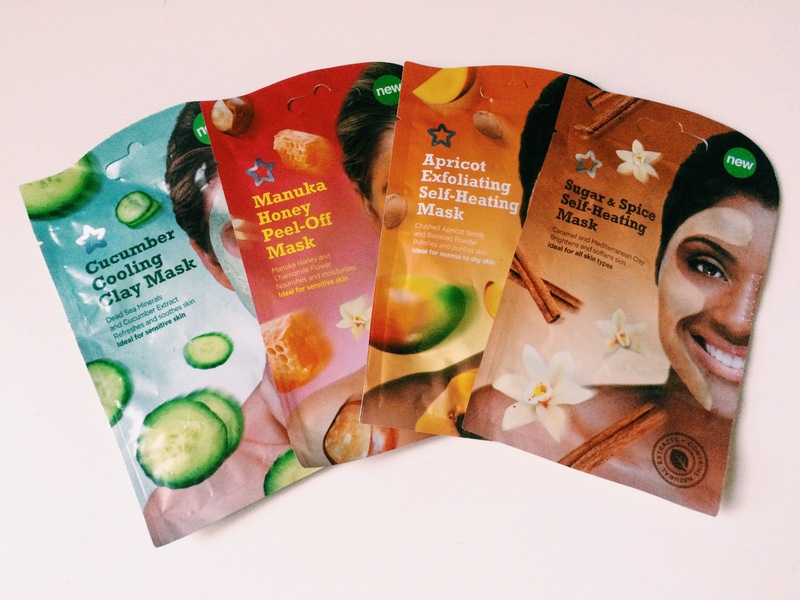 Today I’m going to share 4x face masks to help with any complaint. They’re all cruelty free, and can all be bought for under £1 from Superdrug. All but the Manuka Honey one are vegan, too. Sugar & Spice Self Heating Mask. This is perfect for when your skin is looking a bit dull or pallid – whether you be tired, hung over or recovering from a pesky cold, you should reach for this. It’s self heating, so it opens your pores up for a deep cleanse, whilst caramel and Mediterranean clay work to soften the skin. Cinnamon brightens your complexion and vanilla soothes. The end result is a super relaxed feeling, and touch-soft skin. I find this mask great for fighting skin irritations – mostly breakouts or during colds where you feel stuffy and bunged up. It’s also my favourite mask to use “just because” since its invigorating but gentle. The cucumber is refreshing and awakening while dead sea clay helps to eliminate impurities. It feels really refreshing and clean after rinsing off, and I love to use this the morning of a make-up free day. Lovely. I had never successfully used a peel off mask until I tried this one, but I love it. Manuka honey is known for its cleansing properties, but added chamomile makes this mask as relaxing as it is cleansing. It helps lift dead skin from your face and leaves you looking really fresh and glowing. It does feel very strange when drying, but it’s worth it at the end. If you were the sort of kid who likes to paint their fingers just to peel off the PVA then this is the mask for you. Last but not least is the Apricot Exfoliating mask. I assume we’re all familiar with exfoliation, but despite having a regular face scrub I like to add in this product every now and again. As with the cinnamon mask, the self-heating means the pores open, allowing the apricot seeds and bamboo powder to gently buff and lift impurities gently. This smells absolutely divine and leaves your skin super smooth. I love to use this the night before I go out, or before a long-haul flight as it seems to replenish moisture like nothing else. So there you have it. Superdrug also do several other masks but these are my favourite. They often run promotions so it’s easy to get these at 3 for £2 and that’s when I stock up! I generally have half a dozen to hand and I like to leave them in the guest room along with some other goodies when my BFF stays too. I’m such a great friend. Do you have any go-to face masks?